Fixed handling commented entries when processing a hosts file entry. Refactored and slimmed down the code to fix bugs and handle all sorts of hosts file formatting. Hosts File Manager is an open-source Windows hosts file editor and syntax checker. 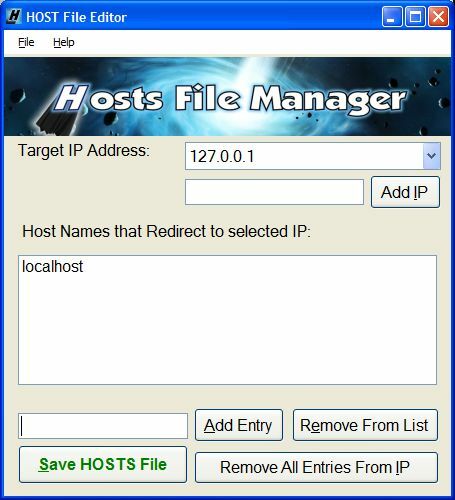 Hosts File Manager allows you to map host names to specified IP addresses. Create as many entries that redirect to different IP addresses without having to manually find the hosts file and edit it. Manually editing the hosts file can lead to mistakes, which could ultimately lead to a non-functioning hosts file. Hosts File Manager checks and corrects the syntax of the hostnames and IP addresses that you add to the hosts file through the program. Easily add entries, change entries, maintain the hosts file, remove entries, export settings, open external hosts files, and save hosts files. Hosts File Manager will even create a backup of your original hosts file on first run. What Does the Hosts File Do? The hosts file is a file used in Windows to manually map hostnames (URLs and just pointer names) to IP addresses. Before your computer queries the DNS server on your network in order to resolve URLs and names, it checks the local hosts file for an entry mapping the host to an IP address. If an entry exists in the hosts file, the location the name redirects to will take precedence over what the DNS server returns. Thus, if you create an entry for yahoo.com and tell it to redirect to 192.168.0.1, users will be redirected to 192.168.0.1 when querying yahoo.com from your local PC rather than Yahoo's normal IP address of 72.30.38.140. Why Would Anyone Create Entries in the Hosts File? In some cases, if you run a web server on your local network, you will not be able to reach your website from your internal network. You are unable to access your web server internally by using your domain name because most network devices do not support loopback. When your DNS server queries your domain, it returns your external IP address which is reachable from the internet by anyone outside of your local area network. However, your external IP address cannot be used on your local area network because your network device doesn't allow you to send data back to your own network. As such, you have to manually enter a record into the hosts file for each domain so that it resolves to the web servers internal IP, as again, you are unable to access its external IP address internally. Hosts file entries can also be used to prevent unauthorized web access by certain programs that try to send registration data back and forth or other sensitive information. The more domains and names you add to the hosts file, the messier it gets. Thus, use Hosts File Manager, the only open-source program that checks your syntax while making adding hosts file records easy. Automatic Installer (.exe) - Downloaded 2280 times! Manual Installer (.zip) - Downloaded 2280 times! Source - Downloaded 2394 times! Hosts File Manager must be run with administrator permissions! Hosts File Manager is completely free and will remain free, but donations are welcome. Or, you could always hire me.